El club, like everybody calls it, has a really new and modern gym part with all the machines to workout by yourself. But they also have 3 halls where they offer a lot of classes all day long. My favourite is bodypump where you get an entire body workout in 50 minutes with weights. But the nicest part of the club are the 4(!) pools. One indoor and 3 outdoor. 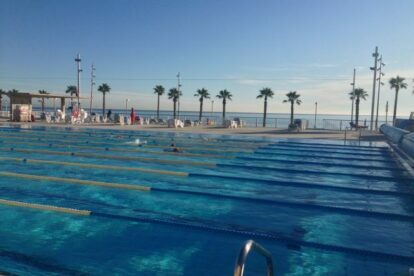 Two of the outdoor pools are heated, so even in winter it’s perfect to swim outside. From the outdoor pools you also have an entrance right to the beach. There are lots of sunbeds to relax outside by the pools. So you can say that you have been to the gym without anybody knowing whether you just laid down in the sun and finished the last part of your book or you had a killer workout..